I agree. I also take Omega 3 as well as Zinc and Vitamin D.
Been ages since I have been sick. I do also take several other vitamins and minerals. As well as eating healthy. I can attest to the benefits of fish oil for osteoartritis! It's been a life saver! My husband swears these are so needed. 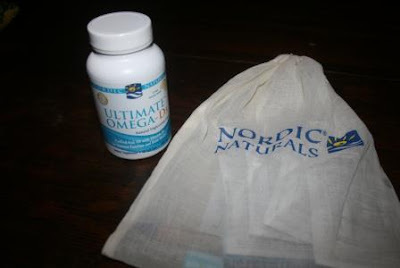 I generally don't take supplements due to my other meds I take, but I know the benefits of omegas. Great review! Taking Omegas at our house too! I'm going to give them a whirl! Anything to avoid those awful 'fish burps'!! I'm usually pretty good about remembering to take my organic multivitamins, calcium, and probiotics (and fish oil when I remember). I've found that when I remember to take them regularly, it helps me a lot. My first semester of grad school, I wasn't taking them regularly (or at all!) and I'd gotten strep TWICE! But once I got back in the habit of taking them daily (and trying to get enough sleep), it's helped. With the new semester having started and a completely different routine this time around, I sometimes get to school (about a 45-60 minute drive one way) and realize I've forgotten to take my supplements! This one for us too! I have been increasing my omegas as well using Walnut oil in my salad dressings and cooking etc. I also use a ton of FlaxMeal in our bread I make. We also eat a lot of fresh Walnuts. Always on the look out for a way to increase our intake. Being vegetarian I do go that route but either way I agree Omegas are surely important to get in ones diet. I'm sorry to say I don't take vitamins like I should, so maybe I need to research the link. Thanks for the reminder, Lisa! Omega threes are important for inflammation and lots more. Do dome research on Krill, too. I switched to that awhile back, it's an amazing source. Yep, I take Omega 3's for the same exact reason but also to help keep my cholesterol levels in check!! Fish is so darn expensive these days! So I'm happy I can at least get my Omega 3's through capsule form! Omega 3's are great and very essential to our health. I take them daily. Woohoo!!! Farm Boy and I have both taken Omega 3's for years. My hairdresser can't believe I have the skin and hair I do at my age, I chalk it up to the Omegas baby! I take omega 3 everyday with my vitamins. Very important! I take these (not this brand), but in liquid form. Just 1 teaspoon in my protein shake and I am good for the day. The older I get the more I want to be in optimal shape and eating right starts first. Soft gels drive me crazy because I too have a hard time with large pills, but having it in liquid form helps me digest it much more faster. I take Omegas as well and Nordic is a great brand. I take them for awhile and then forget why I take them and stop. Thanks for reminding me why I need to take them again. That or eat more fish right? Hmm I might need to check these out. I'll admit I'm not that great at making sure MY health is on track. I'm busy keeping up with the 4 kids, husband and dog. Last year I had a scary scenario with my heart. Had to wear a monitor for a month and have a bunch of tests - come to find out I was super low on Vitamin D. I need to do a better job of taking care of me! I take a fish oil called Lovaza. It was prescribed by my doc to be more regulated in purity by my doc. Shaune is constantly bugging me to take an Omega supplement. Maybe I should. Great post! We love our omegas too! Especially for pregnant & Bfing moms. By the way there are still some spots open for this product review! If anyone's interested, you can read this link for more info. I like the idea of the pet supplement. Kona is such a picky eater-and at this moment she has skipped her last three meals! I worry about her getting the proper nutrition.